“I don’t think it’s appropriate. I don’t think it’s relevant,” said Democratic Lt. Gov. Donna Lynne, when asked if she would release the past three years of her tax filings for public view. “I don’t know what relevance it is in a gubernatorial election,” she said. Before becoming the state’s second-in-command, Lynne, a first-time candidate, was an executive vice president of the Kaiser Foundation Health Plan. She has put $100,000 of her own money into her campaign so far, and was the only candidate who flat-out said she wouldn’t release her taxes when asked by The Colorado Independent. Media outlets routinely request tax returns from candidates because they reveal more than mere income: They show sources of income and potential conflicts of interest, charitable giving, the use of tax shelters, how candidates manage their own money and how their tax rates compare with the average taxpayer’s. Make no mistake, the refusal of these candidates to participate in a longstanding and uncontroversial disclosure is a very serious breach of trust and longstanding tradition. In the case of Donna Lynne, this nonchalant dismissal of the need to disclose basic financial information should be disqualifying–though with her campaign stuck in single digits anyway, it’s doubtful that will ever be put to the test. 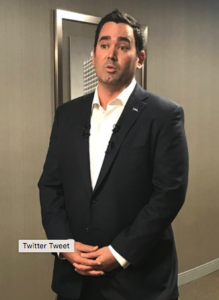 Walker Stapleton, on the other hand, is the Republican frontrunner. It’s been no secret since Stapleton’s election that his financial footprint is extensive and poorly documented. Being shady about one’s finances might slip under the radar in lower elected offices, but a candidate for the state’s highest office has an obligation to demonstrate that he has no disqualifying conflicts of interest. That is not cool. We can only hope there is some outrage to spare for it. For people who think the Repugs only care about the wealthy and the 1%, Stapleton is the embodiment of that. He fits that caricature to a T.
Given his job performance as Treasurer, I'm pretty sure he counts his state salary as passive income too. Dubya and his campaign …. really, I'd expect a Bush relative and a long-time front-runner and someone spending so much on his campaign would have worked out a response that both he AND his campaign would use. It isn't a surprise that someone is going to ask about releasing tax returns. I would like to know if he has been earning a public salary AND continuing to "consult" or getting fees from his former consulting work. If a trust is REALLY blind, I don't need a public release of its contents, but I would like to know what could be a conflict of interests. Stapleton continues to demonstrate an approach to politics based on the "I'm entitled" principle. It should be interesting to see if Colorado voters in the Republican primary endorse such a position. Well, of course he has. It's not even a big secret. He still pulls in $150K as CEO of Sonomawest Holdings, and has to put in >10 hours a week on it. The Independent reported on the deal in 2011. He certainly moonlighted for Sonomawest when he was elected Treasurer in 2010, and into his term in 2011. Is he still getting that income? We don't know. Because he doesn't want us to know. Hence no tax returns. He still listed his employer as Sonomawest in 2014 when he contributed $2600 to Scott Tipton's and Cory Gardner's campaigns. And he was running for his 2nd term as Treasurer then. Stapleton Acquisitions, which is probably the "blind trust" he's referring to, isn't actually blind, but bought all shares of Sonomawest in 2011, giving Walker and all his Bushie cousins a heckuva payday. Currently, Sonomawest is a subsidiary of Stapleton Acquisitions. So yes, it's possible that Colorado's Treasurer is getting paid by a California-based investment firm which only recently opened an office in Colorado. He was still shown as its President in 2017. Or he's getting paid by Stapleton Acquisitions, which is managed by his Bush cousins. Then there's Stapleton Realty Partners, LLC, which dissolved in 2014. It would take someone more savvy than I am about financial hokey-pokey to follow the money for Walker Stapleton. He's a greasy mofo. Hey Walker Roberts, we jus wanna’ know who was payin’ you for all that time you weren’t showin’ up to work as Treasurer? Geezuz guy, what’s so hard to understand about that? As for Lynne, no one really cares whether she showed up. Did she even have a job? And Greg, you jus keep thinkin’ . . . a thinkin’ Republican, huh? No one — no one — Republican or Democrat, is gonna’ ever buy that . . .